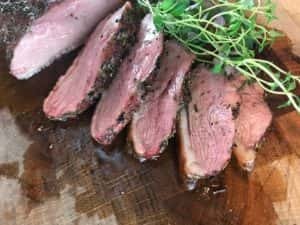 Grilled duck breast is often considered fancy stuff served in high class restaurants only. It may be fine dining, but rest assured, it is simple grilling when you know few tricks. First trick is to cook it reverse sear and second trick is to leave it medium rare. Follow these instructions and you will see what I mean. And if you read the whole story through, you will find the third trick at the end! This is how I cooked duck breast. Grilled, in kamado, reverse sear, medium doneness. 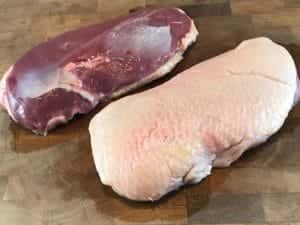 I got two duck breasts, 1lb (450g) each. First thing to do was removing thin membrane and few hard lumps of fat. Then seasoning. 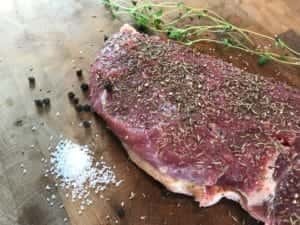 Some kosher salt, black pepper, rosemary and thyme on the back side of the breast (not the skin side). Into the fridge for half an hour. Plan was reverse sear. First indirect heat on low temperature and then final searing on hot direct heat. This method gives nice even doneness throughout the meat. You might have learned the opposite at school. I think we all did. Searing first to keep juices in? Well, this is kitchen voodoo and obsolete science. Searing does not seal any meat surface and keep juices in. It does wonderful things like flavor and color to meat, but that’s it. So, first duck breasts went on the grill grate, on top of the heat deflector. Skin side up. Some pitmasters do this skin side down but when grilling reverse sear, I think my way is better. I like when skin gets crispy facing down on searing stage. My Monolith kamado grill was heated up to 265°F (130°C) and duck breasts spent 40 min on indirect heat. Internal temperature of the meat was then 130°F (55°C). I flipped duck breasts over on top of the direct heat. Pay attention when searing. Duck fat starts to drip on hot coals and flashes over nicely. Searing took only 5 minutes when internal meat temp was 140°F (60°C). That was my target and trick number two. Avoid overcooking. Grilling duck breast much over medium+ doneness turns meat dry and chewy. It is smart to use good quality fast thermometer when grilling duck breast. I like Thermapen as it is fast and precise, but there are others also. Slice and serve your duck immediately. And here comes the third trick. Try put some black currant jam on the side. It goes really well with juicy duck breast!